Since the cloud library integration from CC 2015, smart objects in photoshop are by default linked-via-cloud-account (pardon the terminology, I don't remember it specifically). Previously all smart objects were auto embedded, thus nested smart objects could be opened/edited from the parent file. Sure, you can embed a link smart object by right clicking on the layer, but that is tedious and not scalable. Are there any smart object settings in Photoshop that I'm missing? Browse other questions tagged adobe-photoshop creative-cloud smartobject embedded cc-2015 or ask your own question. How to change smart object outlines and colors? 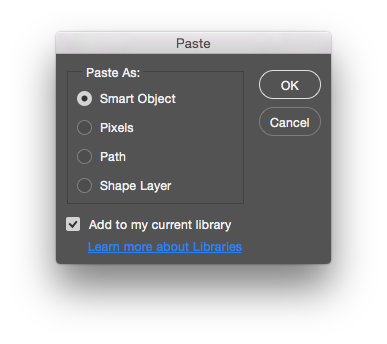 What happened to pasted SmartObjects from Illustrator to Photoshop?